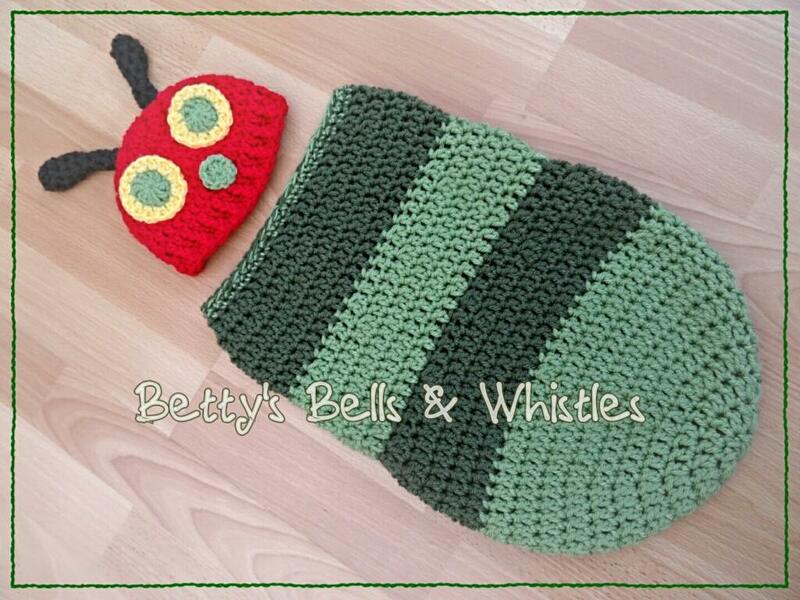 I was asked to make a Caterpillar Cocoon months ago and searched high and low for a (free) pattern that would work with the chunky yarn (stylecraft special) I had bought and had the ridges of a cocoon rather than just straight edges. I bit the bullet and set about designing my own pattern. Eek! It took a few goes to get the increase and decrease rows right so they could be seen but weren’t going to be tight or uncomfortable for a baby. 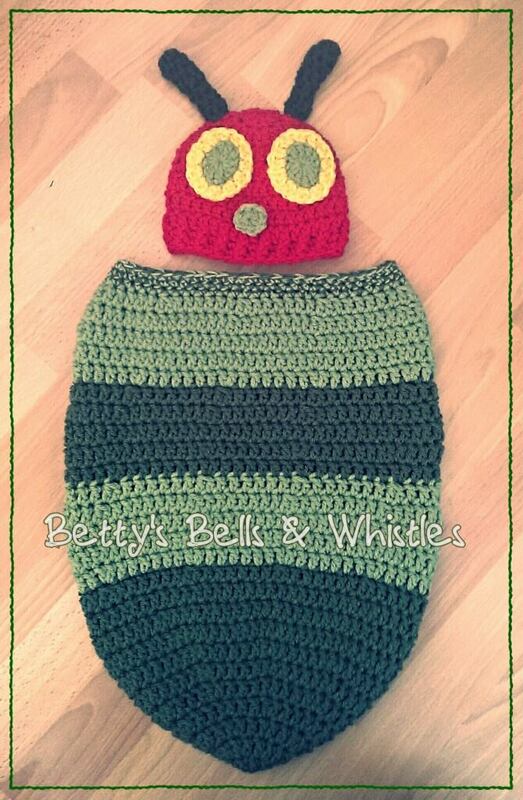 I so wish I had made these for my own babies as I think they would have been so useful for cuddling them in and then transferring them to a moses basket, like a ready made swaddle. I used chunky yarn but two strands of contrasting DK would look good too. This cocoon fits newborn to three months. The pattern is in US terms. Ch2 at the start of a row does not count as a stitch. Start round in the same stitch as the ch2, not the next one. Row 10: Ch2, *DC2tog, DC in next 6*. Repeat ** around. (56) Fasten off this colour and join new colour with a slip stitch. Row 15: Ch2, *DC2tog, DC in next 6*. Repeat ** around. (56). Fasten off this colour. Join new colour with sl st. Repeat rows 11-15 twice more, alternating the colours used. Finish off after a dec to 56 row and sc two rows, either in constrasting chunky yarn or in 2 x strands of dk. Hope you like it. Please let me know if there are any issues with the pattern! PS the hat is a very cute pattern from Hand Me Down Hobby. The second time I made this hat in newborn size I used stylecraft chunky and a 6mm hook. I started with 10 and increased 10 stitches each time until 30 stitches then increased in every 5th stitch to get 36 stitches in total. I did 8 rows altogether and then two rows of the rib edging. « These are a few of my favourite patterns! I have made it about half way through this and it seems really big to me. I am using Medum (sport) weight yarn, and a J hook. Did I do something wrong, or is this pattern for a bigger baby (not newborn). I just made this with one difference. I did it in 1/2 double crochet stitch. I thought it worked up better than the double crochet. Oh I’d love to see a picture if you have one! These are a few of my favourite patterns!